The Pennsylvania Coalition against Domestic Violence has given Todd Smith of Clarion, the 2018 Excellence in male Leadership Award. Smith is a Clarion Limestone High School Teach and Coach. 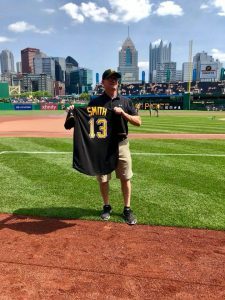 Smith received the award during a ceremony at PNC Park at the start of the Pirates game on Sunday and threw out the first pitch. Smith has coached for over 20 years in the Clarion area and has volunteered to help at-risk students.